I was driving back from the gym yesterday and glanced half-heartedly at a pop-up garden centre in a forecourt car park. To my surprise amongst the clipped box, olive trees and other boring miscellanea, I caught a glimpse of Fatsia 'Spiders Web' which I have been considering since last summer. Having popped back home to get my wallet, I returned and sure enough, it was 'Spiders Web', so struck a deal for a chunky specimen at £20! 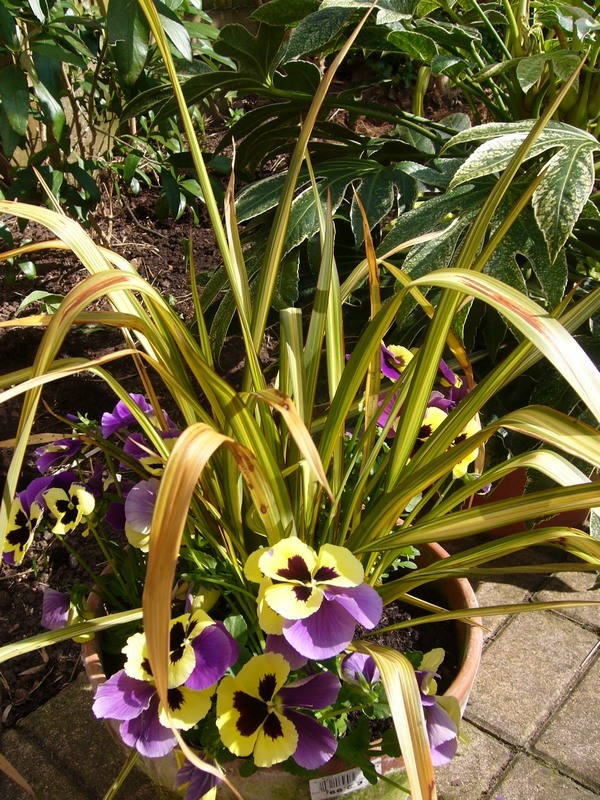 I have just the spot for it next to my Cercis 'Forest Pansy' and I think the contrast will be good, under-planted with a few black-leaved Ophiopogon planiscapus 'Nigrescens'. Don't you just love plant names! 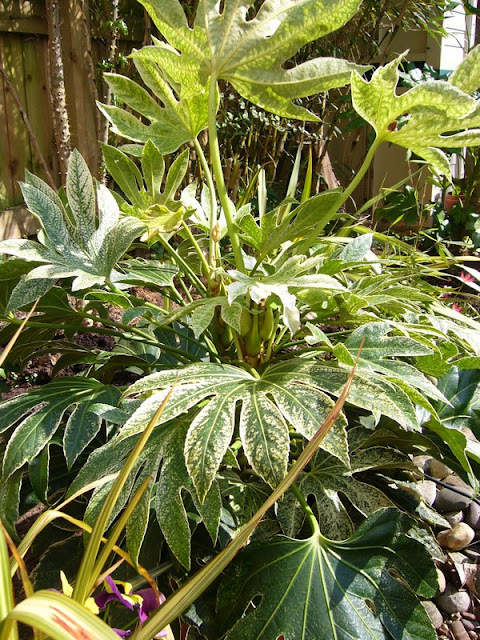 Fatsia 'Spiders Web' - love it or hate it? Variegation could also be a bad attack of red spider mite! The fatsias I really want are F. polycarpa from Taiwan, which has nicely thin leaves and the wonderful golden leaved 'Annelise'. There are only two nurseries that list this latter plant in the Plant Finder. One doesn't do mail order and the other is always vague - saying 'plants in propagation'. I wish nurseries wouldn't list plants unless they have a realistic chance of supplying! Anyone know of a supplier? Having a few gaps in my planting, I've made a few other purchases. A local garden centre had some named Phormiums in the reduced area with hardly any damage and offered at an amazing £3 each. I bought 'Maori Queen' and 'Apricot Queen'. 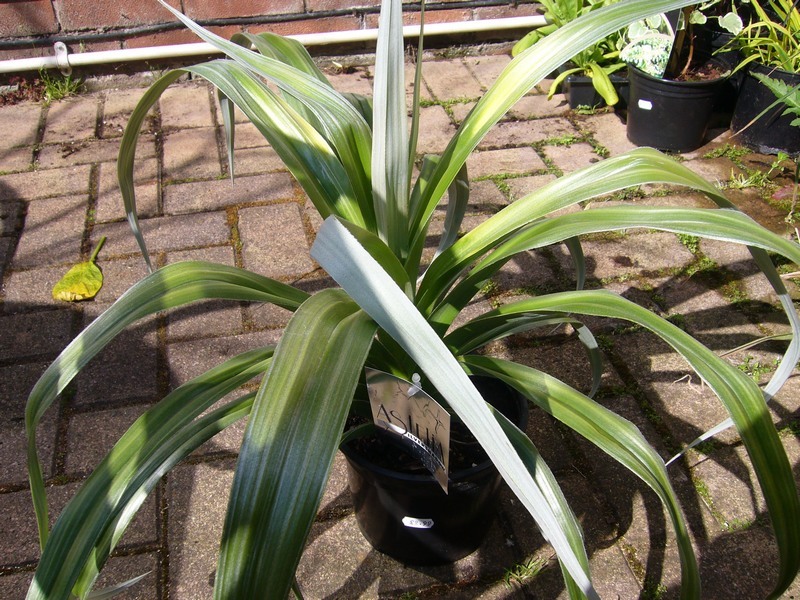 Astelia 'Silver Shadow' was irresistable, although I am dubious of its hardiness. Its a curious plant, similar to 'Silver Spear' but with a sort of three-way, triangular appearance to its leaf arrangement and at the moment having just one stem compared to 'Silver Spear' which is always bushy. When we had the last tough winter, I lost 'Silver Spear' but 'Westland' survived. We shall see about this new one! The new Astelia - will it be hardy? 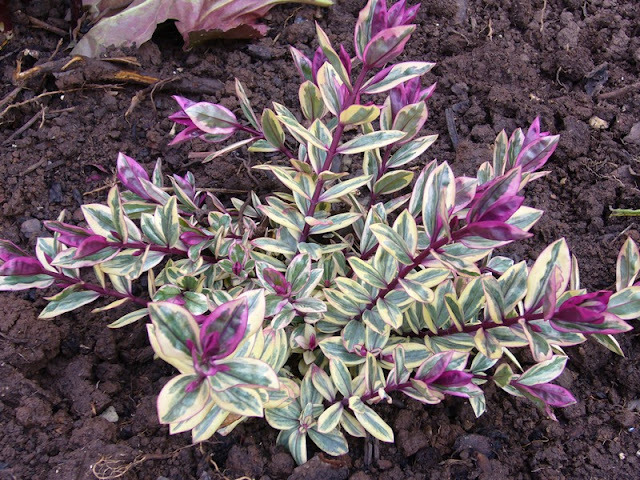 I love coloured foliage and so couldn't resist Hebe 'Rhubarb and Custard,' although that too may be a bit tender for the Midlands. 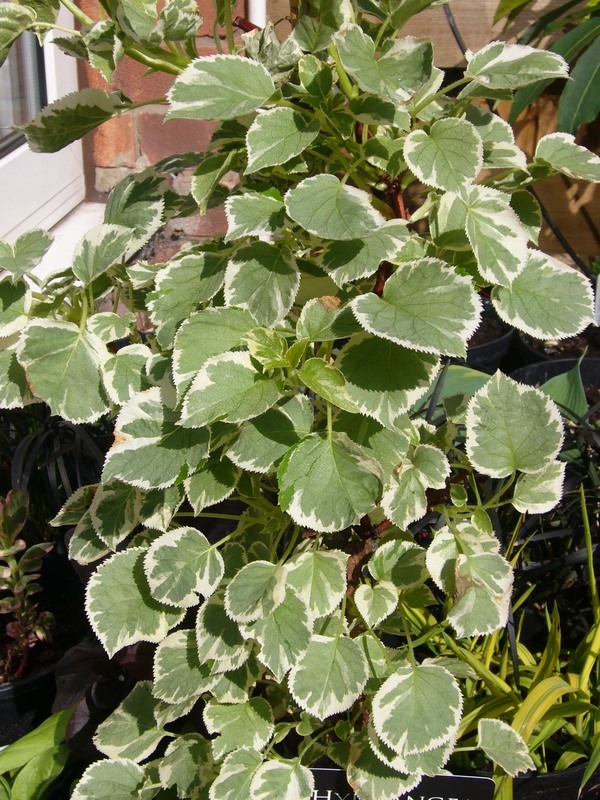 I also bought the variegated Hydrangea anomala 'Silver Lining' which will go on my shady fence and hopefully lighten up this dark corner. Last year when I replanted at the front of the house, it was a toss up between this and Schizophragma 'Moonlight' and the latter won, so I am now pleased to get this too and have a justifiable spot for it! Hebe 'Rhubarb and Custard' not that I've ever seen those colours on my plate! Variegated climbing hydrangea and yes I am a total sucker for variegated or coloured foliage! Although it has been good to work in the garden in the dry and warm these last few days, having done my planting, we could do with some rain. Are we gardeners ever happy with the weather? Some very nice plants there! We've found Astelia Westland much hardier than Silver Spear which can be hit or miss. 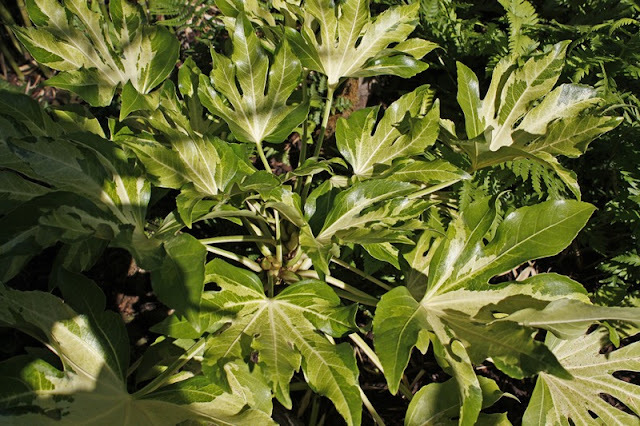 As for the Fatsia Annelise, keep an eye on the houseplant section of any of the general garden centres you visit, you are more likely to see them there and they do get imported by batches from Holland.